To Canada, where a woman showing up to vote won’t be forced to remove her niqab. But anyone wearing a face covering will be required to sign an oath attesting to their eligibility and to present two pieces of identification, at least one having a current address. Fair enough, then. Or, of course, you could just vote online from the comfort of your own pigsty, naked and strapped to a rocking horse. But sometimes it’s good to get out the house. Sadly, people get offended by clothing. At Anorak we like freedom of expression. You can advertise your own lack of convictions and individuality with a slogan T-shirt; you can sport mis-matched novelty socks on your ears – and this is the limit of tolerance – you can even wear red trousers in town. But some people get upset by clothing. We imagine they’re the sort who crave conformity and like uniforms. 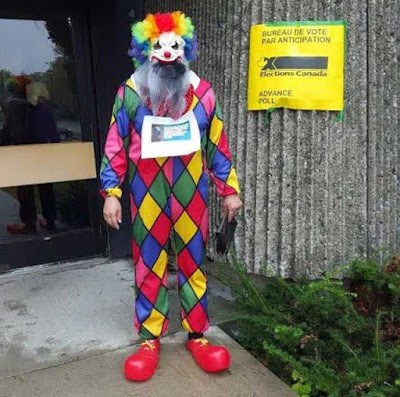 So one chap went to vote dressed in a clown costume and claimed he was able to vote without removing his mask. He said an officer asked him to take an oath to confirm his identity. “Truly sad that I can vote to elect a Canadian prime minister without having to show my face and prove my identity,” says Rafik Hanna. ‘Truly sad’ said the man dressed as a clown. Well, he should know. 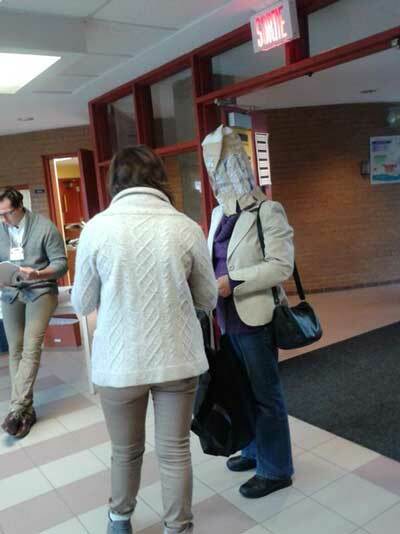 A woman arrived at a polling station in Cap-Rouge, near Quebec City, wearing a potato sack on her head. She looked good in it. It was oddly alluring. Doubtless it will catch on in the deathless martial bedroom. Spud-head was also able to vote after swearing an oath. 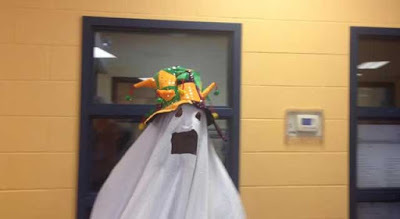 And in Gatineau, a man showed up to vote at the Centre Communautaire Le Baron dressed as a ghost. But he bottled it and showed his face.